You can try XMLBlueprint XML Editor for free for 15 'evaluation days'. You have 15 days of actual usage, every day you use the product counts as a day. You don't have to register. If you decide that you would like to continue working with XMLBlueprint XML Editor, you can purchase a Licence Key on our website: Click Help > Buy Now! (online)... from the menu bar, or open your favorite browser and navigate to https://www.xmlblueprint.com/buy.htm . You will receive an e-mail containing your License Key. 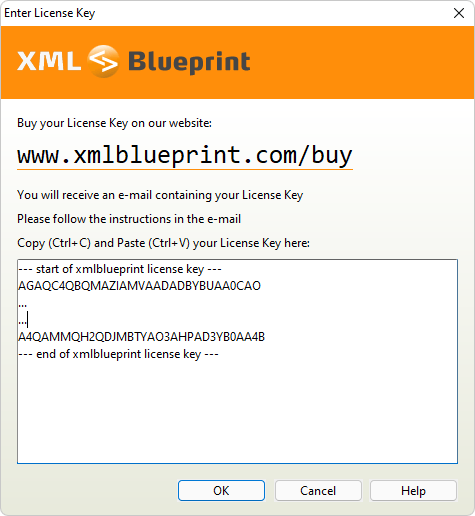 Click Help > Enter License Key... to copy & paste your key into XMLBlueprint.